SonoCon™ Class 3 acoustical panels provide both significant sound transmission loss performance and sound absorption characteristics. These properties used together effectively reduce the noise levels by eliminating the reverberant buildup of acoustical energy within an enclosure, eliminating reflected energy as a source of multiple sound paths, and acting as an effective barrier to the passage of sound. SonoCon™ Class 3 acoustical enclosures and soundwalls ship complete and ready for setting into place. Shorten installation times and minimize disruption. Factory applied special coatings provide durable and attractive finishes. Unitized assemblies meet Code structural requirements. Integrated silencer ventilation systems are sized for the equipment, application and use. SonoCon™ Class 3 acoustical popanel assemblies are factory assembled and shipped as unitized structures ready for Installation as sound controlled rooms, equipment enclosures or acoustical barriers. Where shipping limitations apply, the SonoCon™ Class 3 acoustical assemblies are shipped as multiple subassemblies which are quickly connected to the foundation and to each other. Acoustical enclosures can be engineered and detailed to match the most demanding architectural esthetic specifications and the most severe environmental conditions. Engineered in accordance with local and national building codes. SonoCon™ Class 3 sound control structures are constructed of components tested and rated by independent acoustical testing laboratories in accordance with ASTM test procedures. 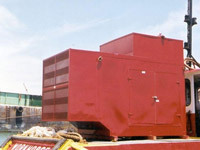 Attenuate equipment noise to comply with community noise regulations or company safety requirements. Provide safe and quiet areas for personnel in otherwise unacceptable high noise level areas. Provide acoustical isolation for such specialized activities as music practice and recording, to provide environments for diagnostic procedures including audiometric testing, and to construct test chambers used in product development and quality assurance. Acoustical hinged equipment access panels, sliding and swinging door assemblies. 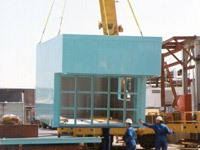 Removable wall and roof sections for machinery service. Provisions for electrical devices such as controls, power outlets and lighting fixtures. Penetrations for pipe, ducting, special utilities, material handling equipment, and control devices engineered to eliminate or minimize noise flanking. Silenced ventilation and air conditioning equipment. 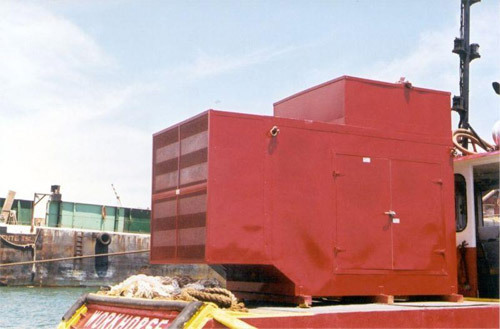 Ventilation openings are provided with sound attenuation devices such as silencers which match the acoustical enclosure attenuation requirements. Factory applied powder coatings provide durable and attractive finishes as well as protection against corrosion. SonoCon™ Class 3 acoustical panel assemblies are fabricated of stainless steel, galvanized steel, or aluminized steel to match environmental conditions. Acoustical floors and vibration isolators. SonoCon™ Class 3 enclosures can be shipped configured to meet NFPA, NEC. and local building code requirements for hazardous (H) occupancies. SonoCon™ Class 3 acoustical panel assemblies are noncombustible, non-hygroscopic, and non -toxic. 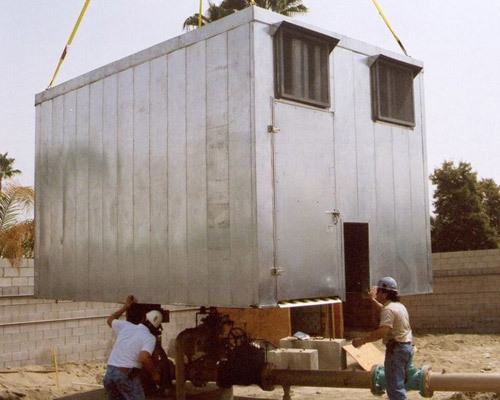 The panels are constructed of corrosion resistant galvanized steel. The acoustical core is moisture resistant and can be furnished with impermeable acoustical fill protection to guard against oil or particulate infiltration. SonoCon™ Class 3 unitized acoustical enclosures and barriers are fabricated from 4-1/2" acoustically rated panel assemblies. Panels consist of inner and outer steel sheets sandwiching an acoustical core. All standard construction is non-combustible meeting Class A and NFPA 90A criteria. The acoustical fill is non-hygroscopic, non-settling and will not promote the growth of bacteria or mold. The acoustical core materials also possess excellent thermal resistance properties. 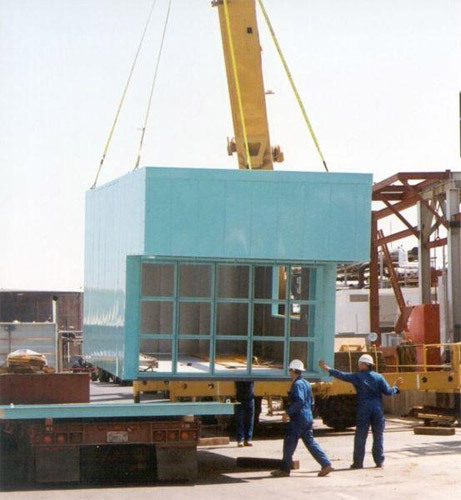 Since panels used for many applications must fit in unpredictable spaces and conditions, all panel assemblies are fabricated to the required physical and environmental specifications. 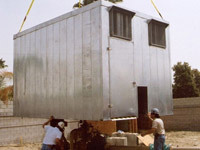 Typical construction utilize a galvanized 16 gauge steel exterior with 20 gauge perforated interior sheet. This finish is acceptable for many applications. For special architectural or corrosion considerations. factory applied powder coat finishes are furnished In high temperature, aseptic or wet environments. SonoCon™ Class 3 acoustical assemblies are furnished of type 304 or type 316 stainless steel. Sound transmission loss (dB) is a measure of the amount of airborne sound energy which is prevented from passing through the barrier assembly. Sound transmission loss performance is measured at each octave band. Acoustical performance is often summarized by a manipulated average of the transmission loss values between 125 Hz and 4000 Hz and designated as the STC (sound transmission class). Because of the limited frequency range, STC values should not be used in applications where the noise source is low frequency or contains pure tone. Because of potential acoustical flanking paths such as penetrations, windows, door-assemblies, and ventilation equipment, acoustical enclosures fabricated of laboratory rated components may provide less noise reduction under actual conditions. Compatible enclosure accessories, installation procedures, acoustical seals, and silencers are all required to maintain the acoustical integrity of the enclosure assembly and achieve higher noise reduction performance. For instance, windows constructed of tempered or laminated glass, Lexan or polycarbonate can be effective. Windows of monolithic single pane glazing should be avoided.